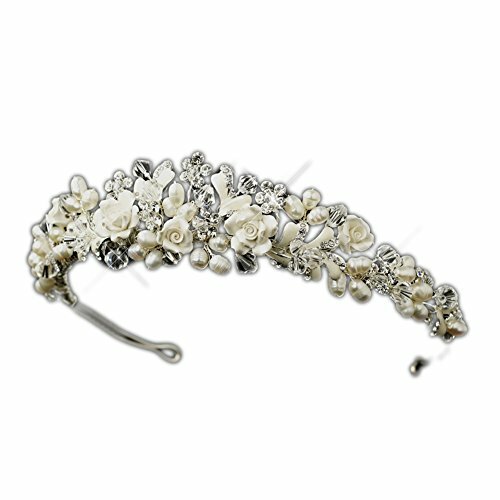 Lots of Wedding Ideas.com - Everything a bride to be should need to get her creative juices flowing for her special day. Slowly gaining momentum is the idea of a two piece wedding gown or wedding separates for the bride. Although they’ve been popular with a few brides for some time it has only been since 2014 that they’ve really gotten coverage at the Bridal Fashion Week. I’ve selected a couple of wedding separates for you to enjoy, but there are lots of other options available from Boho casual 2 piece wedding gowns to actual wedding suits. These two pieces are sold separately and are known as the Elsee Scalloped Open-Knit Crop Top and the Jayde Signature Bandage Mermaid Skirt. Herve Leger signature bandage knit crop top with open scalloped knit trim. Bands graduate in width for hourglass effect. Herve Leger signature bandage knit mermaid skirt. Flares at thigh toward hem; lightly ruffled. Christian Siriano’s take on the two piece wedding dress has a ‘heavier’ feel to the Herve Leger one with the use of organza instead of the open knit used on the above top, it will definitely appeal to a different bride. These two pieces are again sold separately, but why you wouldn’t want both of them is beyond me! Christian Siriano burnout mirrored organza crop top. Approx. length: 15″L down center front, 17″L down center back. Christian Siriano burnout organza paneled skirt. Approx. length: 46.5″L down center front, 50″L down center back. Flares toward hem; short back train. This gorgeous outfit features both a sequined beaded crop top and a sequined illusion hem skirt, so let’s look at them in more detail. Alice + Olivia “Ezra” sequin and beaded patterned top. Approx. measurements: 14.5″L from shoulder to hem, 15″L from center back to hem. Alice + Olivia “Rizo” sequined sheer georgette skirt; tonal slip. Approx. measurements: 43″L front center to hem, 45″L back center to hem. Soft ruffled hem; back extension. 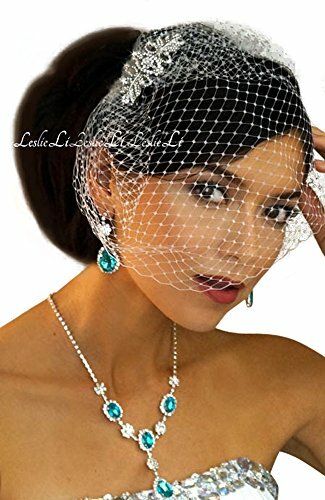 This entry was posted in Uncategorized and tagged two piece wedding dresses, wedding dress, wedding gowns, wedding separates on July 31, 2015 by Lou. 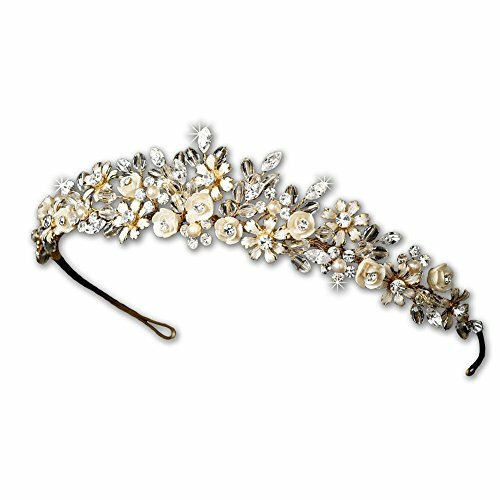 When I think of a vintage wedding lots of things spring to mind, but the first two are usually lace and pearls which is probably why lace and pearls wedding invitations are becoming more and more popular. 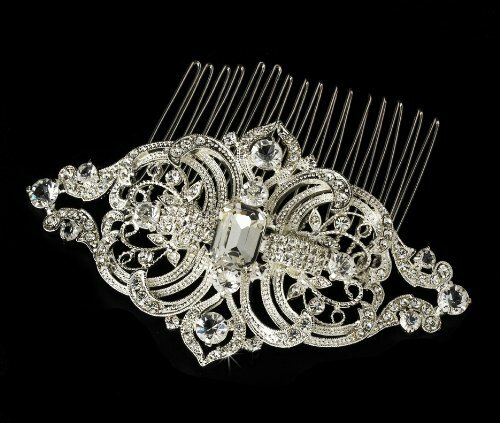 Vintage weddings have been a rising trend of late and it shows no signs of slowing down any time soon. With vintage weddings being such a really hot trend in the bridal world using a pearls and lace wedding invitation is a great way for you to stamp a vintage vibe to your wedding from the beginning. 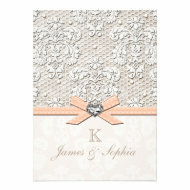 There are lots of gorgeous pearls and lace wedding invitations to choose from – some feature lots of pearls with lace while others feature just a pearl and lace. 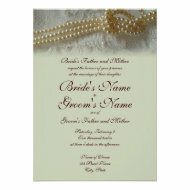 These invitations show that you can add a strong color to lace and pearls and still make it work – including gorgeous raspberry, earthy moss green, bright aquamarine and more – the beauty of lace and pearls is that they really do work well with any color. Okay so I popped an ivory invitation in there, but it was beautiful don’t you think? My preference has to be the bold blue though as I think it’s a strong color that works really well. 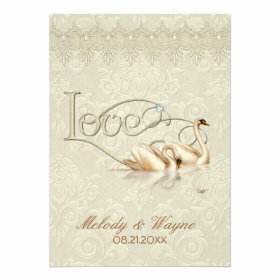 As a side note swans are a great idea to add to your wedding invitation as they symbolize grace and fidelity. This entry was posted in Uncategorized and tagged lace inspired wedding invitations, pearl and lace wedding invitations, pearl inspired wedding invitations, swan wedding invites, vintage wedding invites on June 30, 2015 by Lou. 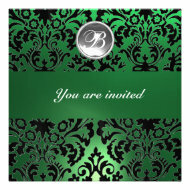 If you’re looking for some emerald wedding invitations then I’ve found a lovely selection for you right here. 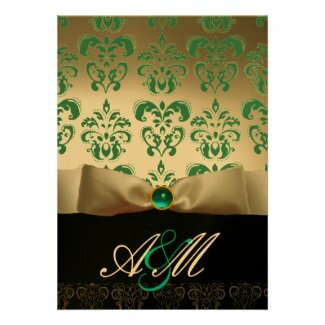 Emerald, aside from being a gorgeous shade of green, has been touted as one of the hot for 2013-2014 weddings according to industry color experts Pantone. If you love this gorgeous shade of green then you’ll love the selection of emerald wedding invitations that I’ve compiled for you. A popular way of incorporating emerald green into your wedding is by using a peacock themed wedding as their feathers have a really gorgeous shade of emerald in them. 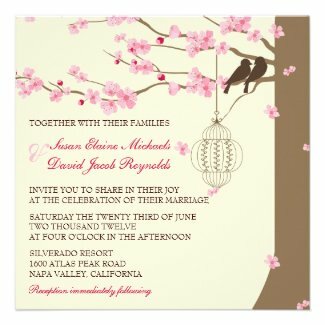 There are lots of different styles of peacock wedding invitations that you can use so you need to think about how much peacock you want to use along with what complimentary colors you want to incorporate alongside the peacock feathers. 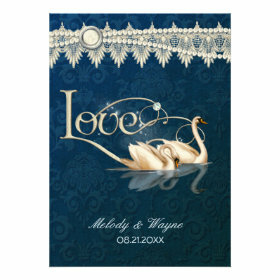 For example you can really embrace the peacock feathers like with these next two wedding invitations or you can just use more of a block color with the peacock feathers only being part of the design. These two wedding invitations have used gold and gold with black respectively as contrasting colors which work really well with the peacock theme and seems to hint at a very lavish affair. 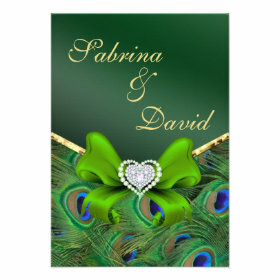 Gold has also been incorporated in these next two wedding invitations which gives the emerald green more of a look in as a color block as opposed to just in the peacock feathers. We’ve already seen how black and gold work well with emerald green and peacock feathers and another color that looks great is brown or chocolate. This color is already visible on a peacocks feather so you know that it will compliment it well. 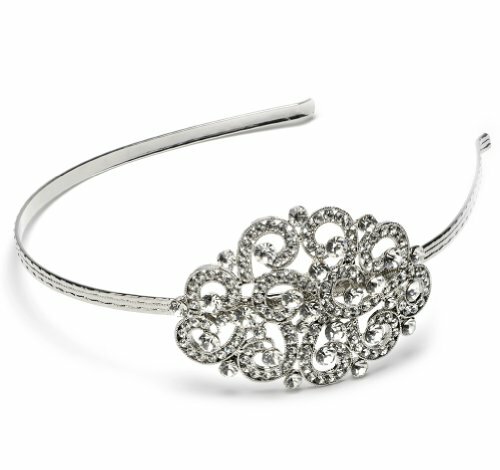 Chocolate has been a popular wedding color to use for a while now so it shouldn’t be too hard to find wedding accessories that incorporate it. 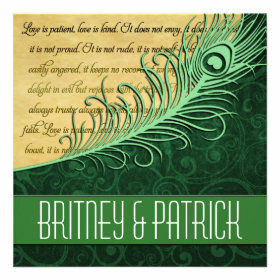 See how well it works with these next two emerald green and chocolate peacock wedding invitations. 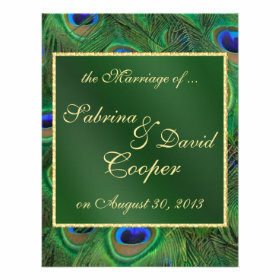 There are lots more peacock options when it comes to wedding invitations, but I just want to look at two more before looking at some other emerald wedding invites. 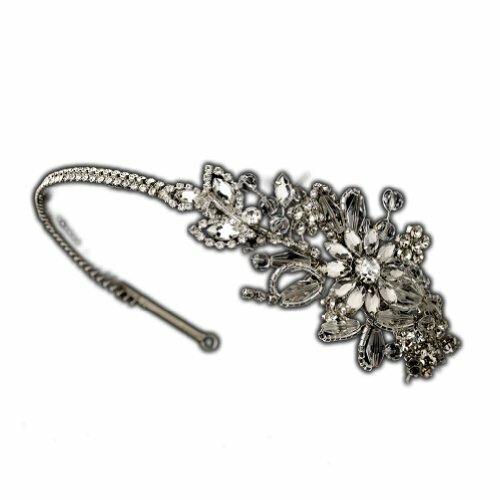 These next two are both vintage designs which are incredibly popular, I personally love the first one as it almost seems as though the peacock is in a 1920s birdcage veil! 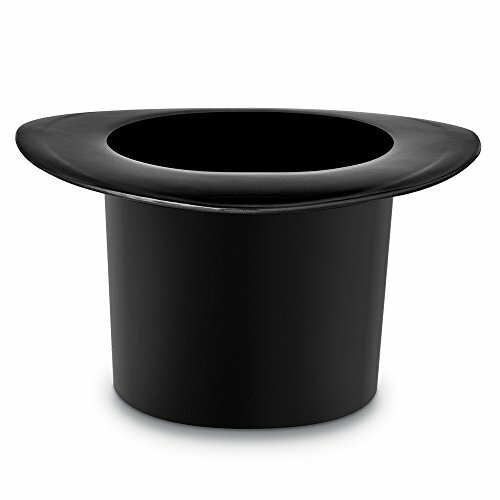 Gothic is often thought of as having a color palate like Henry Ford’s cars – black or black, but there’s actually a number of colors which Goths embrace and emerald green is one of those colors. 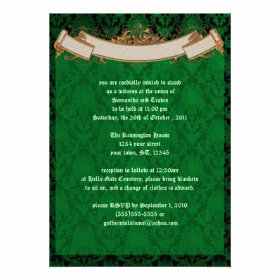 If you’re looking at holding a Gothic wedding then emerald green could make a nice color to add to your scheme and these wedding invitations would certainly be very nice. 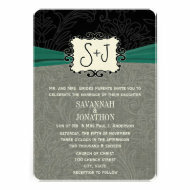 You can check out more Gothic invites at – Gothic Wedding Invitations. I love the invitation to the left of us with the Celtic cross as it keeps the dark tones that are associated with the Gothic culture while adding little bursts of emerald as well. 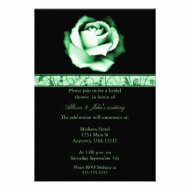 If you just want to add a little touch of Goth to the proceedings (don’t want to upset Grandma or the future in laws for example) then you can try emerald green with a black damask pattern – the invitations below could be incorporated as a little nod to that side of you while keeping the rest of the wedding more ‘traditional. These wedding invitations are a beautiful nod to the color green and incorporate a getting back to nature feel to them as well as a vintage vibe. 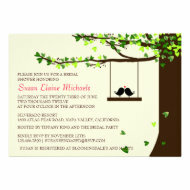 Either of these invites would be perfect for a simple or outdoor wedding. 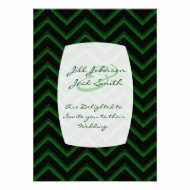 If you’ve decided that you love emerald as a wedding color, but you don’t want to go with a peacock or Gothic theme then you may be wondering what colors will combine well with emerald and I have to say that one of the simplest color combos is simply emerald green and white as you can see with these gorgeous wedding invitations. Black is another color that looks stunning when used with emerald. I, personally think that the black and emerald color combination may become the most popular emerald wedding color combination because it looks good with just a dash of black or with a lot of black and a dash of emerald. As we saw earlier with the peacock wedding invitations gold also compliments emerald really well giving it quite a luxurious feel to the occasion. 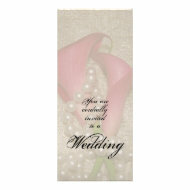 I love the wedding invitations at Zazzle because the quality is great and the costs are very reasonable. Most designers on there have a full range of wedding stationery in the same design and if you want something that they don’t have most of them are more than happy for you to contact them to request it. 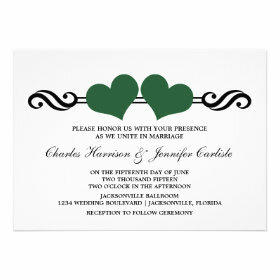 This entry was posted in Uncategorized and tagged emerald wedding invitations, green wedding invitations on June 30, 2015 by Lou. When Kate Middleton walked down the aisle of Westminster Abbey the eyes of the world were upon her and her gorgeous wedding bouquet. Kate had decided on a simple yet elegant flower – the Lily of the Valley – and it’s brought the flower back into the minds of brides everywhere. 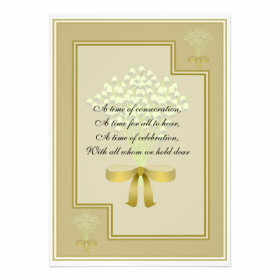 If you’d like to incorporate lily of the valley into your wedding then why not start off with a lily of the valley wedding invitations – there are some beautiful ones available. These beautiful white flowers with their sweet fragrance are said to symbolize humility and purity. These lily of the valley wedding invitations bring a dash of style to your wedding showing the beautiful flowers bending over and looking like the type of flowers fairies would use as hats! 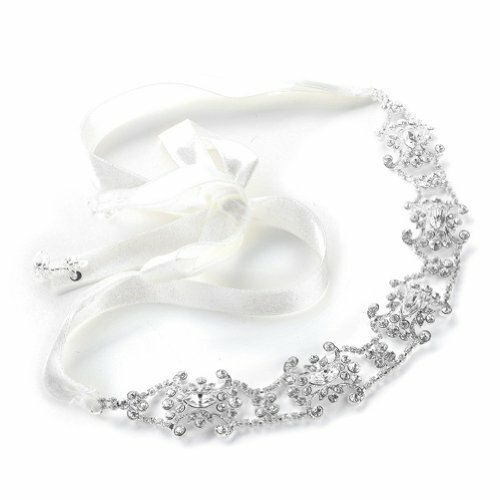 Being a white flower is just one of the reasons why lily of the valley suits so many different wedding styles. I must admit to being a little biased towards this flower because it was my late grandmothers favorite. I only have one picture of her on her wedding day and it doesn’t show her flowers, but despite not having a wedding dress she did have a posy of lily of the valley which was probably the only ‘extravagance’ seen at her wedding. 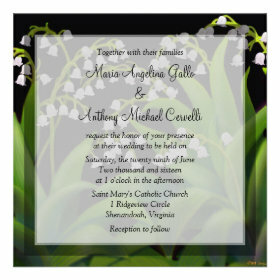 As you can see from these invitations you can use lily of the valley with just about any wedding color scheme and with the royal nod of approval it will also suit both vintage and contemporary styles really well. This entry was posted in Uncategorized on June 30, 2015 by Lou. Spring, Summer and Fall weddings are all very well, but for a truly magical wedding how can you go past a winter wedding, especially if nature provides you with a majestic dusting of snow for your special day. There are lots of different themes you can use for a winter wedding from the traditional winter wonderland theme to a festive Christmas affair and lots of alternatives in between. Let’s explore how your winter wedding can be one that everyone will remember. 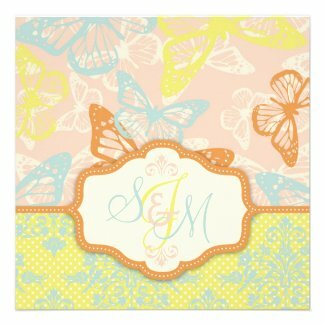 Now for some reason people seem to find it easier to choose a color scheme for a spring or summer wedding than for any other. When it comes to fall weddings they tend to go for traditional fall colors, but what about winter wedding color schemes? Well if you have a color that you really like then use it whatever season it is, there really is no hard and fast rules that say you can’t use certain colors in the winter. Personally I love the color aqua, but it’s usually associated with summer weddings and beach weddings, however you could use just a hint of aqua with a predominanty white and silver wedding palette to create a modern twist on a classic Winter Wonderland wedding theme. 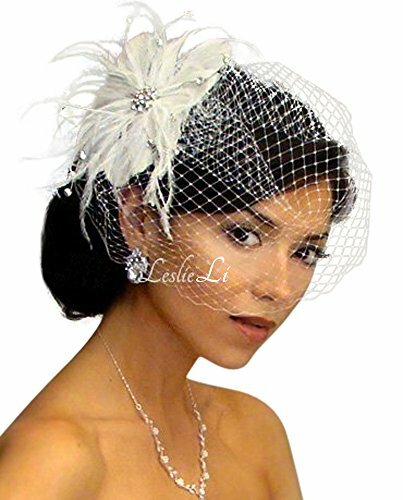 There are certainly a lot of different styles of bride which means that there’s lots of different wedding styles that you can choose. The selection of winter wedding invites I’ve included here I hope can give you a few ideas as to different color combinations you can try as well as different themes/styles. The overwhelming theme that stands out is snowflakes, but there are other ideas coming through as well like poinsettias, Christmas trees and snowmen. If you can’t visualize these color schemes on color alone, then let’s look at some winter wedding themes where you can see them in action along with a few inspiration boards for you to enjoy. A winter wonderland is a classic wedding style for winter weddings and includes icy whites and silvers with a dash of pale blue. 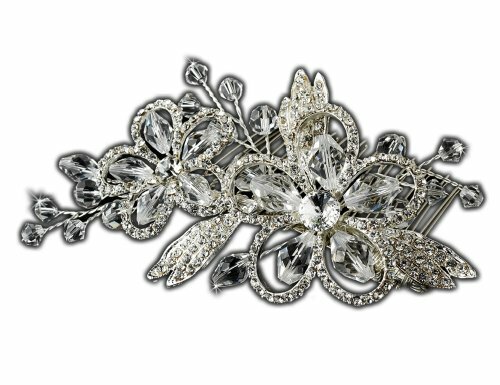 Snowflakes are the usual adornment along with the use of lots of crystal. You can re-create different elements of it as well as adding your own special touches for instance add some pale dusty pink instead of blue to the white and silver for a little touch of warmth. If you love CS Lewis then you can take a leaf out of ‘The Lion,The Witch and The Wardrobe’ and give your guests Turkish Delight as wedding favors like the White Witch (or self-proclaimed Queen of Narnia) did! 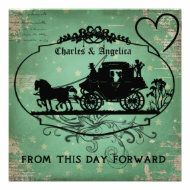 dd a little enchanted sticker like this one to pieces of Turkish Delight and you have a magical idea for a wedding favor that will have guests talking about it for a while to come. You can also give them personalized packets of hot chocolate as well because when you’re riding a sleigh with a Snow Queen of any description a hot drink (especially hot chocolate) is always welcomed ….. and it really does taste good with Turkish Delight! Find lots of great ideas for creating a perfect Winter Wonderland themed winter wedding that will make your day truly special. Black and White are the classic colors for this type of wedding with a hint of a third color in places – that could be green (with floral arrangements), red (very glamorous), gold or even silver. I must admit I love the idea of a Christmas wedding held in the winter, the only Christmas wedding I’ve actually attended was on Christmas Eve and was held in New Zealand where it was summertime – a totally different vibe than the usual Christmas Themed Wedding I can assure you! Now you can go completely over the top with this theme or be a little more restrained it’s entirely up to you. 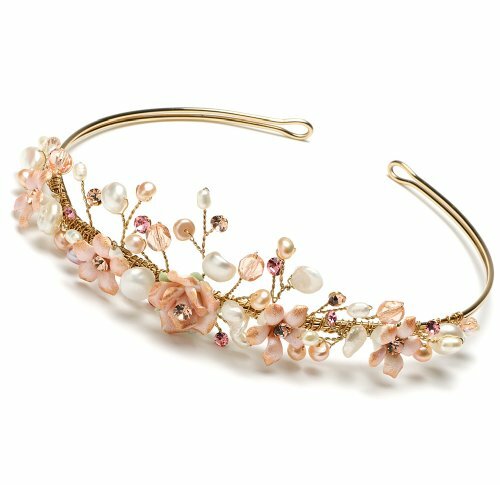 Think of gold, crystal and dusky pink for the ultimate 20s wedding. Although champagne and cream with touches of gold also work well. The couple use marshmallows, yarn, vintage lace and a color palette of white, peach and orange, it really is a cool winter wedding styling. Providing warm cocktails for a signature cocktail gives a novel twist to your winter wedding theme. Another idea is to have a hot drinks bar whether it serves just hot chocolate or tea and coffee doesn’t matter. The main thing is to have this with disposable coffee cups so that guests can grab a hot drink along with an edible favor when they leave your wedding reception to venture out into the cold winter air. This delicious chocolate cocktails are perfect for warming you up in winter time. Add a little ‘extra’ to your coffee for a very nice after dinner drink or a cocktail that will warm you up during winter. This entry was posted in Uncategorized and tagged christmas wedding inspiration, hollywood inspired wedding ideas, winter wedding ideas, winter wedding themes on June 30, 2015 by Lou. If you’re after a simple style wedding with a rustic, diy or shabby chic air about it then why not send out Mason Jar Wedding Invitations? There’s a range of different color combinations available and you can also use mason jars as a theme by using them for centerpieces at the reception or even serving cocktails in them. Mason Jar wedding invitations give a simple country feel to a wedding and is great when you want a comfy, down to earth occasion to celebrate with your closest friends and family. Simple wedding ceremonies seem to be gathering more and more support from people these days especially as people try to save money which is why these invites are so cool – they remind us of a simpler time that many are trying to re-capture. You can incorporate mason jars as vases to give your wedding reception tables a rustic feel for their centerpieces. They can be standing on their own or have ivy wrapped around them. If you like this idea then you can give people a little hint as to what to expect by incorporating the idea in your wedding invitations. 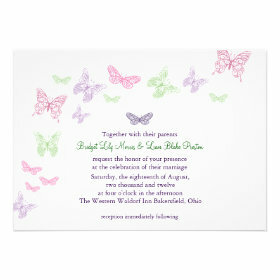 This is also where you can incorporate a wedding color theme with your invitation from purple to yellow, green to pink or a different color all together. You can even use gorgeous hydrangeas in mason jars on your invitations if you like. Hydrangeas are a beautiful wedding theme in their own right so combining them with country mason jars makes your occasion extra special. 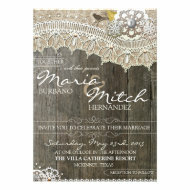 Romantic, Rustic & Full of Southern Charm! Place mason jars along the aisle with tea lights in them – light them up and you have a beautiful and romantic aisle to walk down. As well as adding flowers to them for your table centerpieces you could also add flowers to them and hang them on the end of the pews to give a really cute look as you walk down the aisle. If you’re not getting married in a church then add them to the chairs that are on the ‘aisle’ for the same effect. 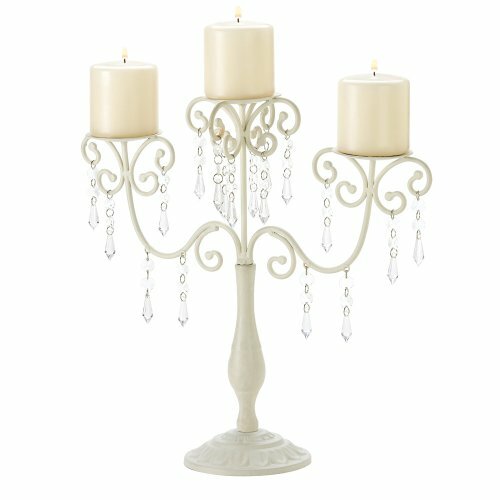 They can also be hung from the ceiling or strung along on long pieces of rope between rafters/trees etc (depending on the venue), either filled with flowers or for a really cool look add some clear or white beads or water beads and pop an led flashing light bulb in each one. 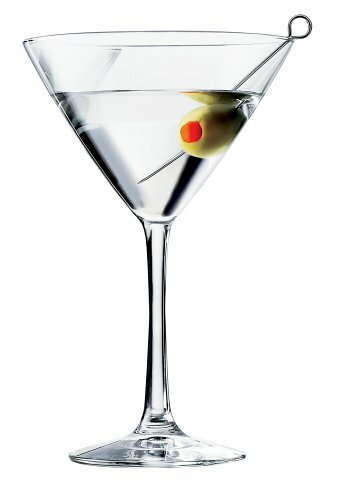 You only have to look at a few Pinterest boards to realize that it’s quite a trendy move to add signature cocktails to your wedding program and serving them up in mason jars is very ‘hot’ in wedding circles right now. Use mason jars as wedding favors – you can either fill them with some cool things such as a bag of cocoa and some mini marshmallows or you could add soil and succulents and use them as table decorations that double up as wedding favors. Of course if you’re having a sit down meal you can also use them as part of the table settings – wrap up your cutlery in a napkin and stand it up in the mason jar. Add a little chalkboard paint or a label to the jar and you can also write names on them to act as a place card as well. Candy buffets look great with a few mason jars! If you’re having a candy bar as part of your wedding then use a few mason jars along with bowls and other containers to keep all the different candy in – it just adds a little variety to the table. This entry was posted in Uncategorized and tagged country wedding ideas, mason jar wedding ideas, mason jar wedding invitations, rustic wedding invitations on June 30, 2015 by Lou.